When Penny and I were shooting our Star Trek pictures last month, we also did some Padme from Star Wars and Wonder Woman themed shots!! Here is a sampling of the lovely Penny sporting some awesome poses and bewitching expressions… Happy last week of 2009 everybody!! Merry Christmas to all!! Happy Birthday to Jesus, our Lord and Savior, and may this wonderful time of year find you all happy and well. Thanks to all our new friends here, and Merry Christmas to all our friends and family and especially to all those serving to protect ours and the world’s freedom!! !…the Soldiers of the United States Armed forces; The Army, Navy, Air Force, Marines, and Coast Guard. Thanks and Merry Christmas to those who protect our friends and other countries around the world, The Canadian soldiers, the Australian Soldiers, the service men and women of the UK, our friends in Japan and across the globe!!! Merry Christmas to you and always remember what this special day is and means to us all!!! 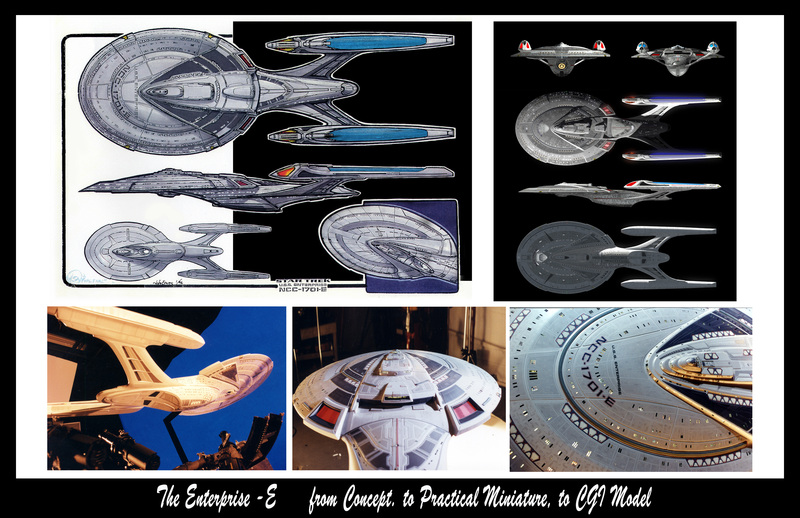 Here is a fun change of pace from the often seen aircraft and Star Trek pin up pictures!! Miss Amanda Lee puts on her western duds for an Old West themed shoot!! Miss Amanda has that pin up magic about her, and no style is less than amazing when she puts her talent and beauty to the test!!! Great work, Amanda, and thanks for yet another fun shoot!! Here is a very fun shot of Jen by the Packard cargo plane in Tucson Arizona!!! This was one fun location and working with Just Jen is always Great!!!! Awesome pose Jen!! I just got word of Dan O’bannon’s passing, and I am quite taken back by this horribly sad news!!! Dan has been mentioned here on the blog many times, and I was unaware that he was battling Crohn’s disease for over 30 years…. Sadly, it looks like he lost the fight on December 17, 2009. He will be deeply missed!!! For those of you who are unfamiliar with Mr. O’Bannon, here is a little write-up for you to get to know him a little bit. Dan O’Bannon’s passion was for movies & writing, and he was quite gifted with an amazing talent to do just that! He went to USC in the late 60’s/early 70’s and teamed up with fellow wannabe film maker John Carpenter. Together they were creating a 45 minute short Sci-Fi movie called “Electric Dutchman,” later to be renamed “Dark Star”! The two men created a hilarious film that was later lengthened and released theatrically. Both Dan and John wore many hats during the production. Dan took on the role as Co-writer, Production Designer, Film Dditor, Visual Effects Supervisor and even acting…playing the mistreated and belittled character of Pinback (who’s real name is Bill Froog, but had to become Pinback because that was the name on the uniform). Dan and John’s film was released on January 16, 1975 ( Carpenter’s 27th Birthday) and died virtually unnoticed!! Today it has become a cult classic. The film brought together some vast movie talents such as Greg Jein, Ron Cobb and Bill Taylor, as well as launching both John and Dan’s careers as major movie makers. Sadly, the partnership did not survive after Dark Star, and both went out in different directions! Dan went on to his next project of trying to get “Dune” off the ground!! This attempt fell apart, and Dan went on to do some of the computer graphics for Star Wars. Unhappy with the thought of becoming a computer graphics designer, Dan went back to his first love of writing and wrote what would be one of the greatest Science fiction films ever made!!! “Alien” was it’s name, and the mega hit came out in May of 1979. Along with Star Wars, the look of space movies coming out of Hollywood changed forever. From there O’Bannon went on to write many other landmark films and stories. He wrote two of my favorite segments entitled “Soft landing” and the awesomely horrifying “B-17” from the “Heavy Metal” movie released in 1981. Next he wrote “Blue Thunder,” which he was terribly displeased with; the story had been heavily rewritten and had lost it’s political edge by the time it made it to the big screen. The same happened with his screenplay for Lifeforce (1985). In 1986 he wrote a wicked little screenplay for the remake of “Invaders from Mars,” and I was happy to be a part of this one. I had just started working at Apogee VFX house in Van Nuys, making Invaders and Top Gun the first two movies I got to work on. I was extremely happy to be working on a Dan O’Bannon and Tobe Hooper film!! Dan switched to the director’s chair with another cult classic, “Return of the Living Dead,” and then moved on to write another SCI-FI favorite, “Total Recall”. “Bleeders”, “Screamers” and “The Resurrected” would come in future years. Dan was a huge fan of Science Fiction and H.P. Lovecraft, as you could tell by his work, but he was a man of incredible talent in so many other fields; he was hysterically funny, very gracious, very kind and he had a deep appreciation for others and their talents. He had a strong sense of self confidence and rebellion towards authority which made him able to withstand just about anything and not fall apart when criticism was thrown his way. He never gave up and always followed his passions with great pride and imagination. Mr. O’Bannon is one whom I have great admiration for. He was the best at what he did, and his work and talent have definitely inspired me in so many ways!!! He will be missed dearly. Thank You, Dan, and may God bless and be with your family, friends and especially your wife, Diane, and son Adam. this link will take you to a great site that has a lot of Dan’s graphics work and a cool interview as well! Click below to see several great photos of Dan and his amazing work…(if you see the pictures, you’re already there!). 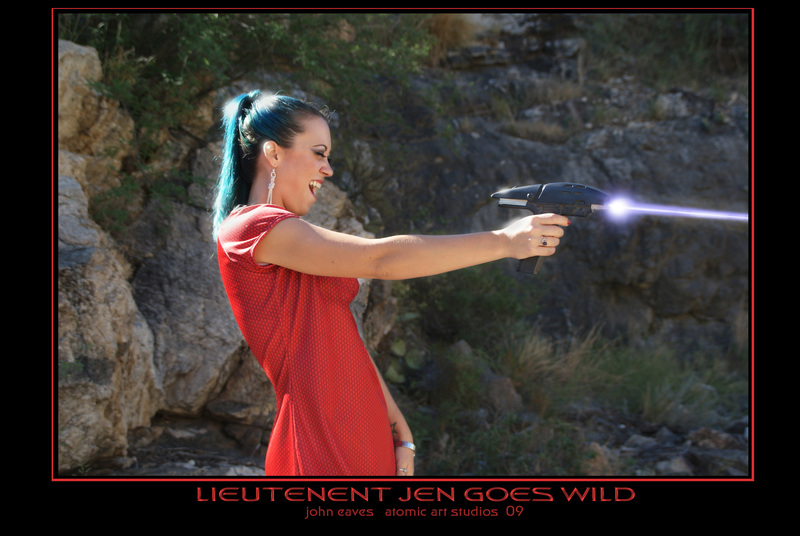 Here is Jen in the Arizona desert giving the ST-V assault phaser ago!!! Jen took out quite a bit of countryside before she exhausted this little blaster!!! Go get ’em, girl!! !